Happy Cinco de Mayo!! Cinco de Mayo is one of my favorite holidays; I think it's a great excuse to go out for margaritas! I love to brave the crowds at one of the local Mexican restaurants for a few drinks and chips and salsa. No matter how you plan on celebrating tonight, you must make this Taco Burger. We started with our favorite burger recipe and added some salsa and taco seasoning. We topped the burgers with a big slice of Wisconsin cheddar cheese, guacamole and some crushed tortilla chips. The burger was amazing! I mean, tacos and burgers all in one - what's not to love?! This was a fun twist to both taco and burger night! 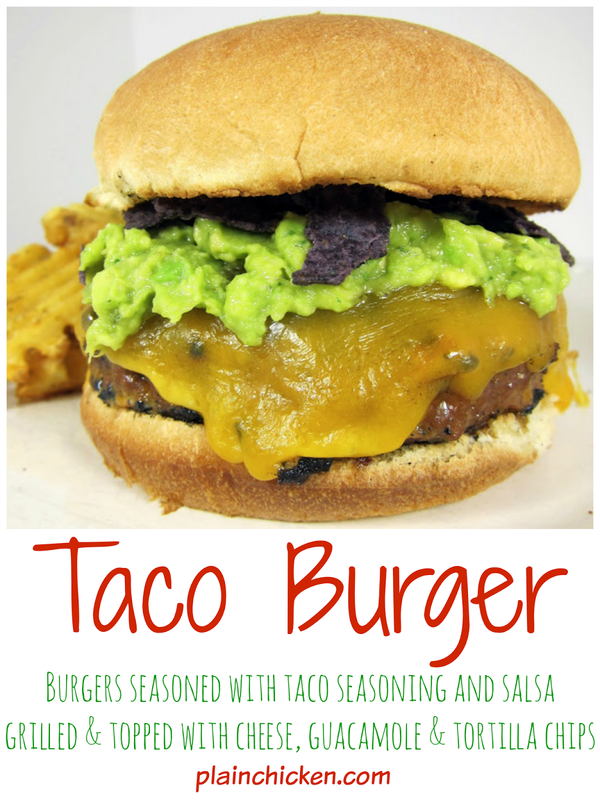 What a cleaver idea to use taco seasoning in this yummy looking burger! a few drinks, late at night, ok, I'll try it. I could not wait to see what you did for Cinco de mayo! You are awesome!!! This looks and sounds delicious. Your blog makes me happy every time I look at it. I'm a fan!